V-Rod fever is on the rise worldwide, especially in Europe and particularly in Germany. Once the V-Rod, part of which was developed in Germany and built with some German engine internals, was unveiled at the Harley Dealer conference in Germany in December, at least half a dozen customizers were rushing to finish the first custom V-Rod. The race was definitely on. But does the public want customized V-Rods? 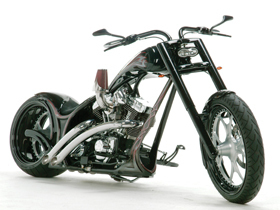 After all, this bike is a perfect synthesis of muscle and style. In fact, all that steel and aluminum makes you cry out for sunglasses! But Harley-Davidson knows what its customers want: individuality. So much so that at the V-Rod’s press launch, a fat accessories catalog with about 75 custom parts was already available. But there are some requests that Harley-Davidson cannot – or is it will not? – fulfill. Once the decision is made to go further than the H-D P&A book will carry you, who do you turn to? In Germany, the Speed-Point custom shop in Iserlohn has a longtime reputation of building Harley drag-racing machines and powerful custom street bikes. That’s because Speed-Point’s Volker Prior knows how to get the right people together and get things done. 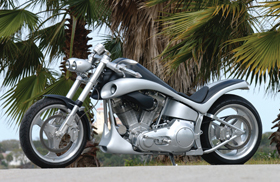 In fact, Speed-Point was the first company to manufacture aluminum/ceramic brake systems for motorcycles. Speed-Point was also the first to offer automobile-quality, cast aluminum wheels for the European custom bike market, both of which are now distributed in the US by Eurocomponents. 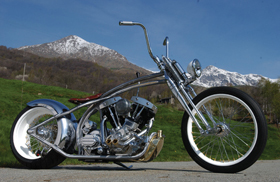 (Eurocomponents offers a continuously expanding range of high-quality Harley-Davidson parts from Europe). This, combined with the fact that Speed-Point knows how to keep a project of this magnitude under wraps long enough to beat the competition, made in the smart choice for a couple of forward-thinking authorized Harley dealers. These dealers were looking for someone to give their precious first V-Rods to for a customizing project. They wanted to grab this once-in-a-lifetime opportunity to lead the European customizing market, even if it’s just for a short time. The two dealerships are Harley-Davidson Konz, which is located near the 2,000-year-old Roman town of Trier, Germany, and MS Cycles of the equally historic city of Innsbruck, Austria. Finding the right customizer is crucial on a project like this. 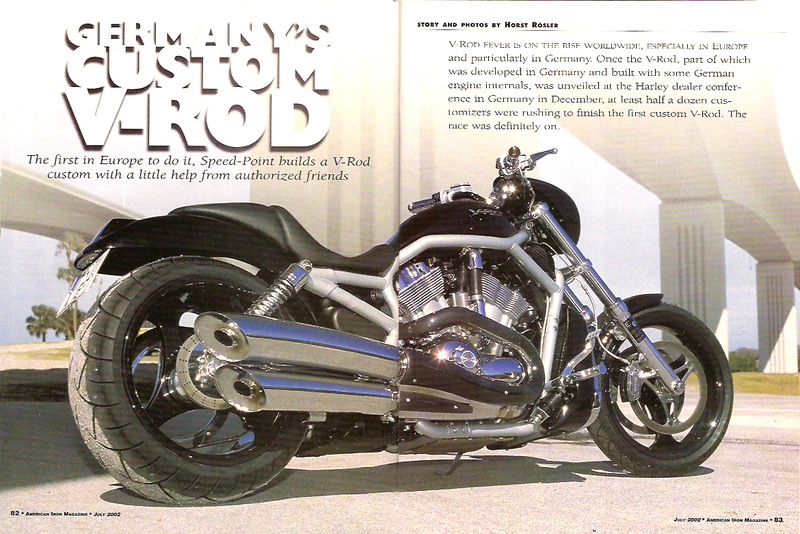 The V-Rod is a very demanding machine to both authorized and independent H-D customizers. The bike has a top speed of more than 220 km/h, at least on the German autobahn, so there’s no way a builder should compromise safety when modifying the rolling chassis. 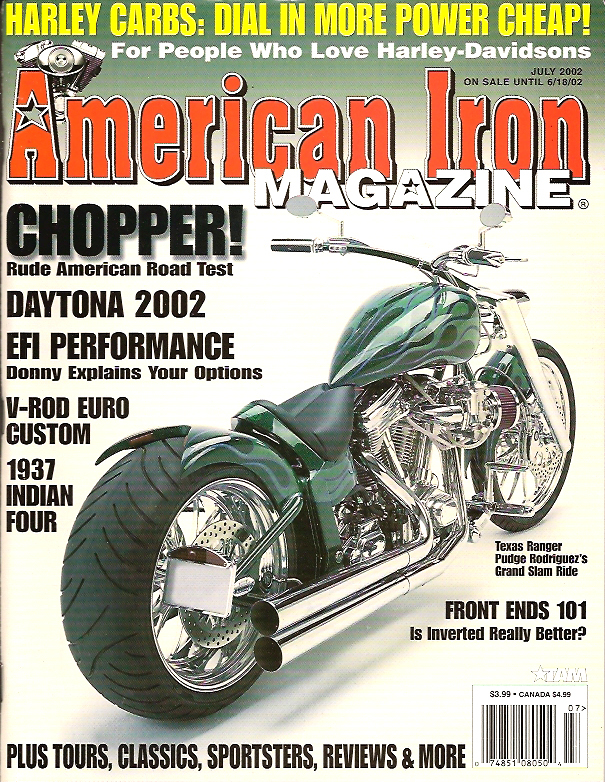 “We didn’t want to change the image of the bike, “explains the builder Volker Prior, “just sharpen it a little bit.” To finish the bike in time for Daytona Bike Week 2002, Volker literally spent his Christmas, as well as many days and nights, working in his shop. (The bikes were to be displayed all during the event, along with some other great German customs, at the Eurocomponents showroom on North Beach Street.) 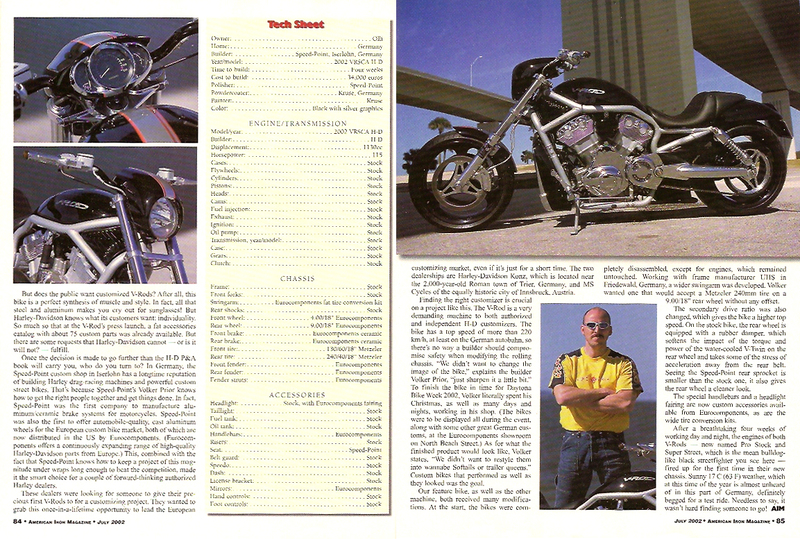 As for what the finished product would look like, Volker states, “We didn’t want to restyle them into wannabe Softails or trailer queens.” Custom bikes that performed as well as they looked was the goal. Our feature bike, as well as the other machine, both received many modifications. At the start, the bikes were completely disassembled, except for engines, which remained untouched. Working with frame manufacturer UHS in Friedewald, Germany, a wider swingarm was developed. Volker wanted one that would accept a Metzeler 240mm tire on a 9.00/18” rear wheel without any offset. The secondary drive ratio was also changed, which gives the bike a higher top speed. On the stock bike, the rear wheel is equipped with a rubber damper, which softens the impact of the torque and power of the water-cooled V-Twin on the rear wheel and takes some of the stress of acceleration away from the rear belt. Seeing the Speed-Point rear sprocket is smaller than the stock one, it also gives the rear wheel a cleaner look. The special handlebars and a headlight fairing are now custom accessories available from Eurocomponents, as are the wide tire conversion kits. After a breathtaking four weeks of working day and night, the engines of both V-Rods – now named Pro Stock and Super Street, which is the mean bulldog-like black streetfighter you see here – fired up for the first time in their new chassis. Sunny 17 C (63 F) weather, which at this time of the year is almost unheard of in this part of Germany, definitely begged for a test ride. Needless to say, it wasn’t hard finding someone to go!